My So-Called Sensory Life » Blog Archive » Boo! In the past, Halloween has been a scary holiday for M.
Halloween can be very tough on sensory children, autism spectrum children and special needs kids in general. (See my recent post on Parenthood’s episode about Max & Halloween). Normally, as the day approaches his anxiety increases in anticipation of Halloween night but even more so of being “Boo-ed” (see below). The combination of the doorbell ringing (auditory sensitivity) with the costumed trick or treat-er (unexpected) made M cling to me with all his might. Like Pavlov’s dog, I’ve been conditioned to expect the same thing every year. I cringed when our doorbell rang at 7:30pm tonight –of course, we were greeted by a Boo Package and I braced myself for M’s reaction. You have been BOO-ed!! Know that someone is thinking of you in a friendly way! 1. Enjoy your treat! 2. 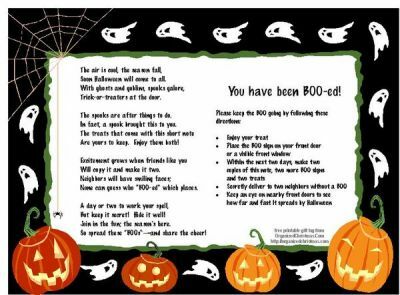 Place the BOO sign on your front door or visible window. 3. Within the next two days, make two copies of this note and two more BOO signs. 4. Make two treat bags or BOO baskets. 5. Secretly deliver to two neighbors without a BOO. 6. Keep an eye on nearby front doors to see how far and fast it spreads by Halloween. Instead of retreating in fear, M screamed with delight! Being BOO-ed was the best part of our day and a gift. So, we’re celebrating by eating the candy, giggling over guessing who left the cauldron and plotting our BOOs! This entry was posted on Tuesday, October 26th, 2010 at 9:23 pm	and is filed under Blog Posts. You can follow any responses to this entry through the RSS 2.0 feed. You can leave a response, or trackback from your own site. What a wonderful neighborhood adventure. I’m sure it makes M’s fears much more predictable and therefore easier to anticipate. He get’s to be offensive rather than defensive! Does he show any desire to Trick-or-treat?